The distribution of the curriculum is not isolated into branches of knowledge but an inter-disciplinary approach is adopted. In the middle school (Std V to VIII), teachers design the curriculum and select textbooks that offer creative educative experiences. 'Graded learning' provides experiences to the pupils relevant to their strengths, needs and interests. 'Project Work' supplements the theoretical acquisition of knowledge, understanding and application in every subject area. Educational excursions, nature trails, exploration camps, monsoon treks and participation in co-curricular activities make the education programme a stimulating learning experience for all. Value Education fits into the curriculum design and offers a holistic approach to education. After Grade VII, parents have the option to continue with Secondary schooling at JNS or opt for the IGCSE Programme at JNIS. The pupils of Std. IX and X are prepared for the Indian Certificate of Secondary Education Examination conducted by the Council for the Indian School Certificate Examinations, New Delhi. Apart from academics, students are also expected to partake in Socially Useful Productive Work as well as community service, through reputed NGOs. 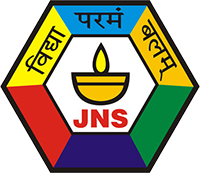 After Grade X, parents have the option to continue with Higher Secondary (ISC) schooling at JNS or opt for the In International Baccalaureate Diploma Programme (IBDP) at JNIS.